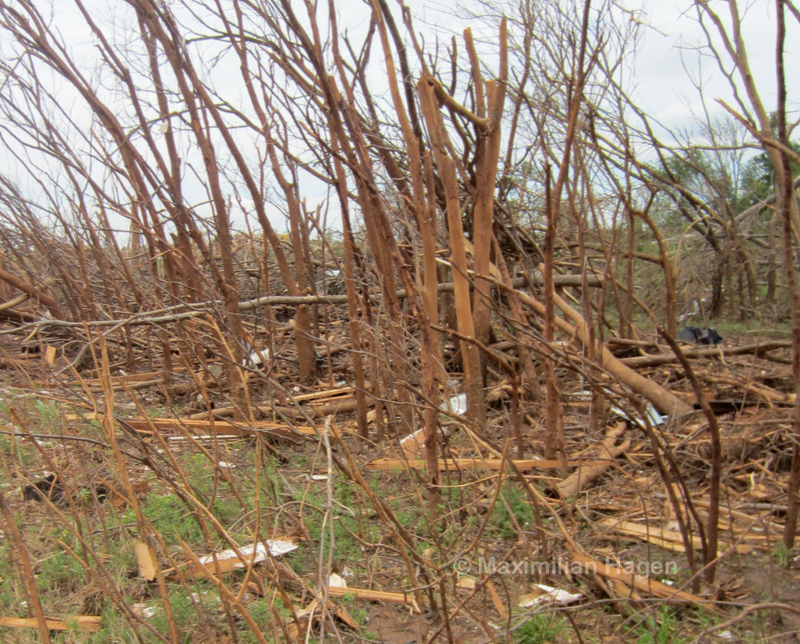 Image of vegetation damage near the location where the highest doppler velocities were recorded more than 400ft above the ground. 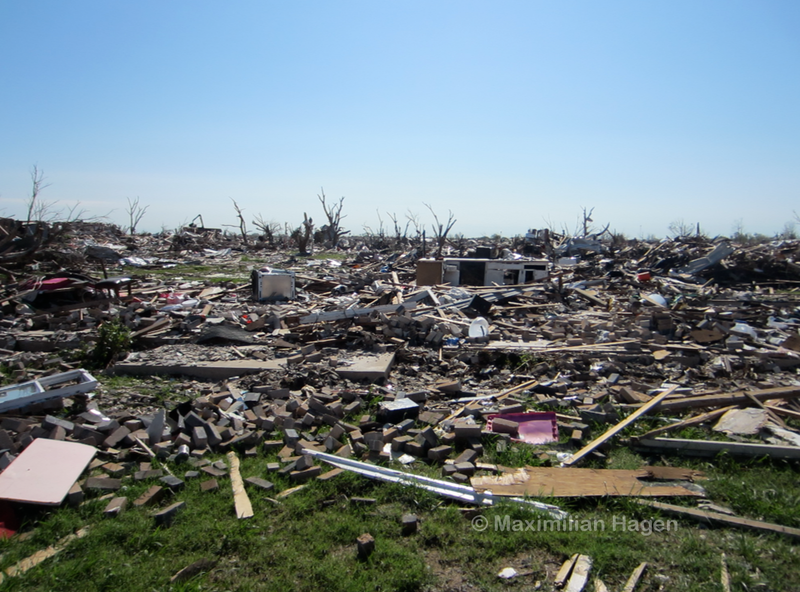 The tornado was given an EF5 rating less than 36 hours after dissipating solely due to mobile doppler radar velocities between 290 and 336mph, possibly the strongest ever recorded (AMS, 2013). 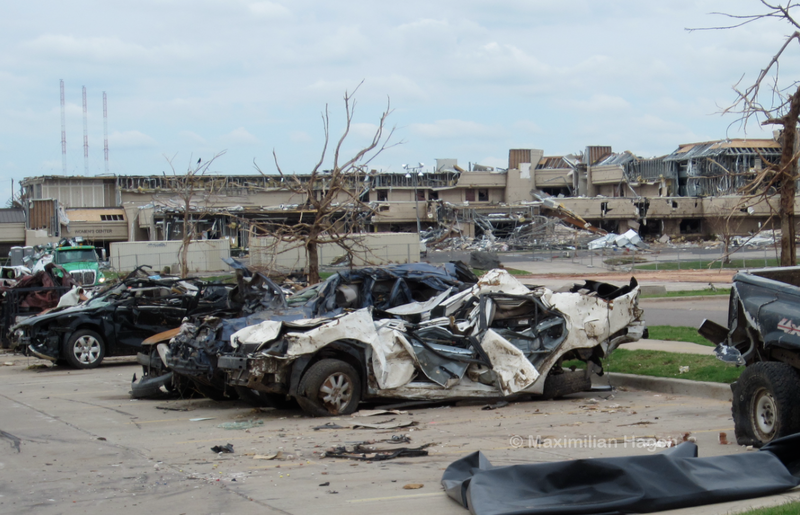 The tornado was later downgraded to an EF3 due to a lack of EF5 damage indicators. □ On May 31, 2013, a train of violent supercell thunderstorms erupted in the sky to the west of Oklahoma City. 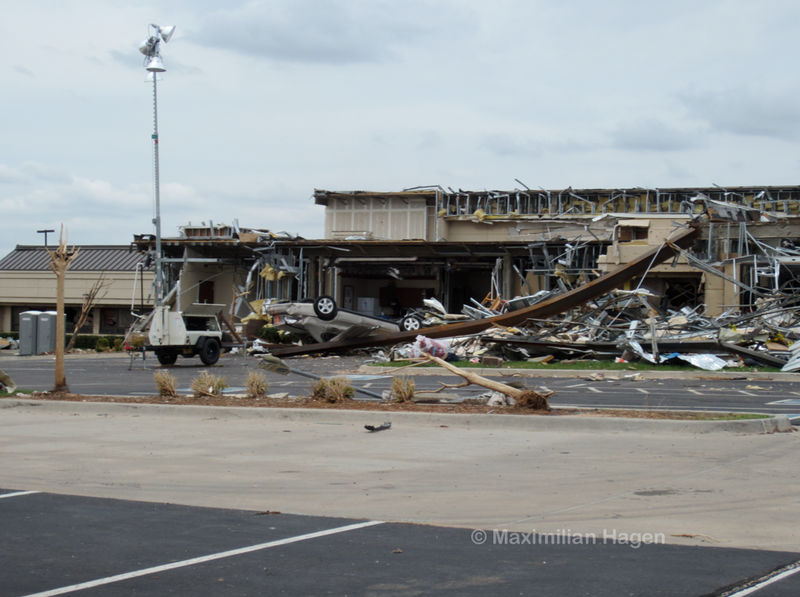 In the city suburb of Moore, rain began to fall over the tangled remains of homes and businesses obliterated less than two weeks earlier by a catastrophic EF5 tornado. Meteorologists at the National Weather Service recognized the tell-tale signs of a rotating mesocyclone on radar, and reports from storm chasers near the community of El Reno quickly verified the presence of a large, nebulous mass of clouds that had spun down to the ground. 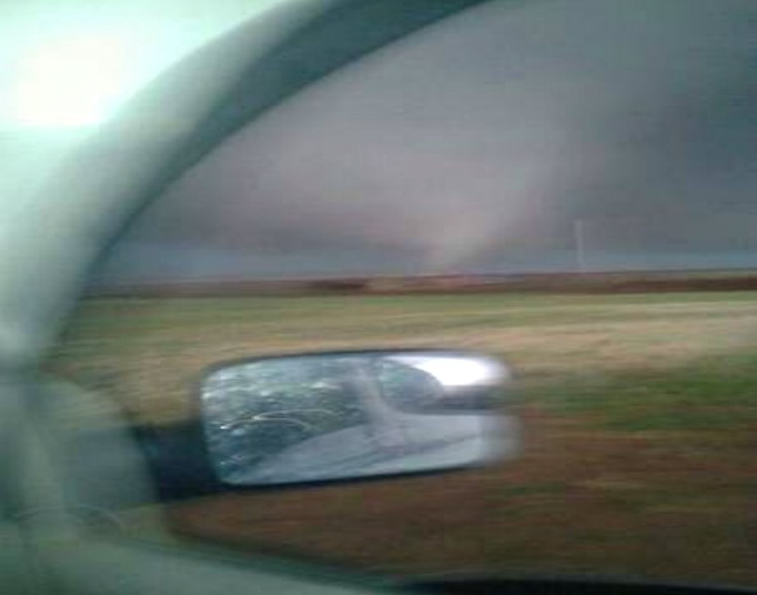 A rare tornado emergency was issued for the area a second time. An unusually large number of storm chasers, both amateur and seasoned, drove down the perfect grid of county roads to the south of El Reno to film the ensuing storm. Like many large tornadoes, the El Reno storm began with a series of transient funnels beneath a rapidly rotating mesocyclone. 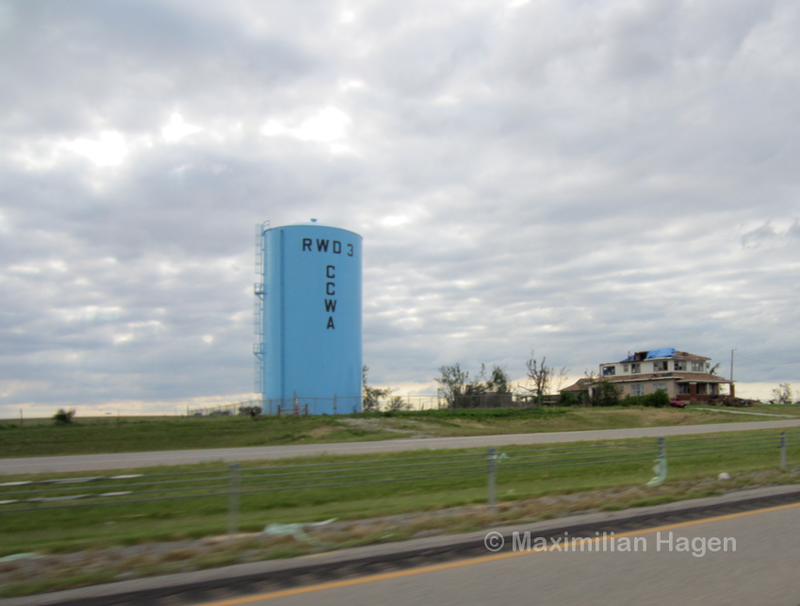 Heavy rain left few good angles to film the storm, so most chasers concentrated near Highway 81 just northeast of the tornado. As the storm progressed slowly to the east-southeast it underwent a period of explosive strengthening. The already large tornado suddenly doubled in size in less than one minute (many say less than 30 seconds) to over two miles in width. Footage from multiple storm chasers showed a sudden increase in surface winds well away from the visible funnel. Near the intersection of Choctaw Avenue and SW 15th Street, two vehicles were engulfed by the storm, killing both drivers. One of the men killed, Richard Henderson, became the first amateur storm chaser fatality in history. Storm chaser Richard Henderson sent this photograph to a friend several minutes before he was killed by the tornado on SW 15th Street. 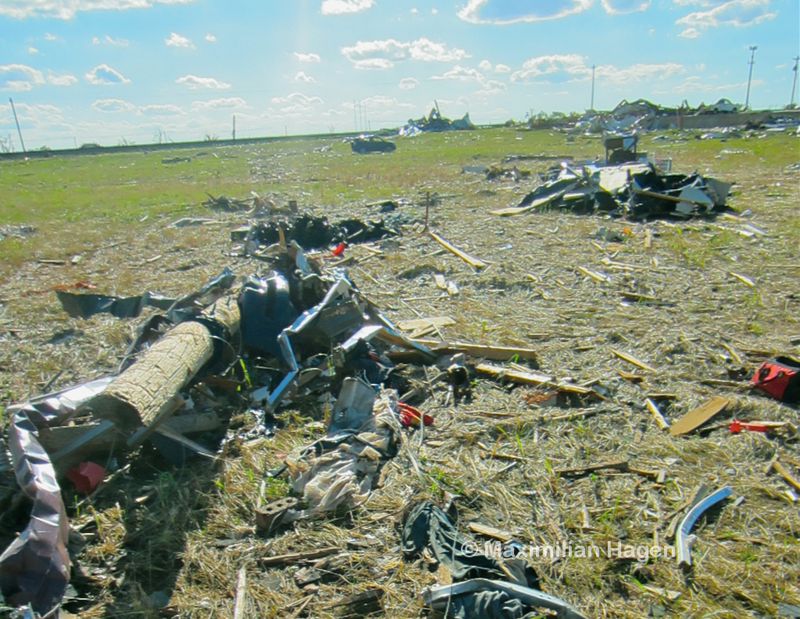 The same friend was on the phone with Henderson when debris began to strike the chaser’s car. Moments later, the line went dead (Kelly, 2013). Trees along SW 29th Street were damaged and a piece of timber pierced 11 inches (measured) into the ground. 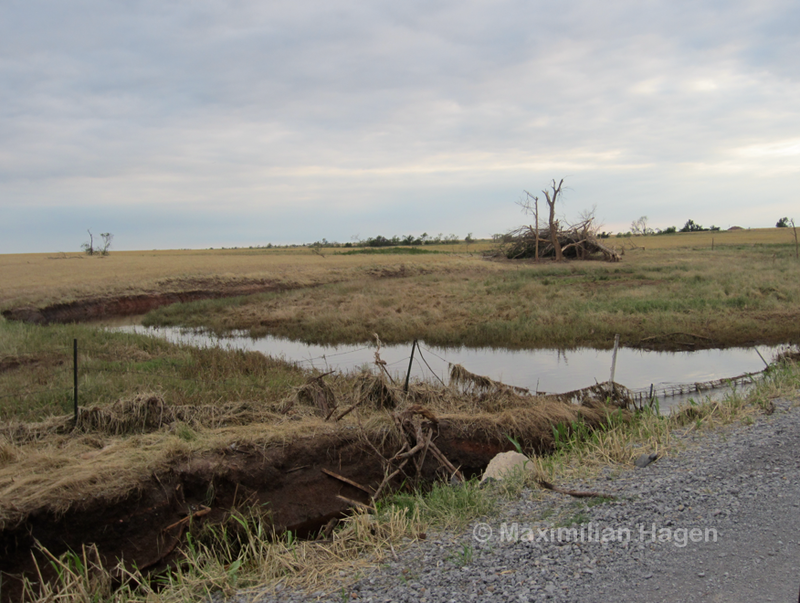 The distance of visible damage along Highway 81 was 2.5 miles, although extreme straight line winds blurred the distinction. 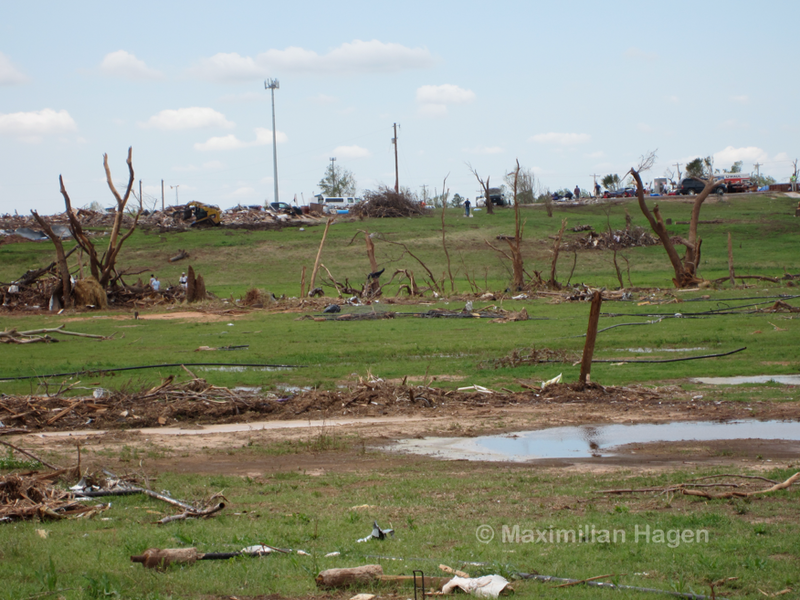 All of the damage visible from Highway 81 was in the EF0 to EF2 range, although wide spacing between buildings and trees left few reliable damage indicators. 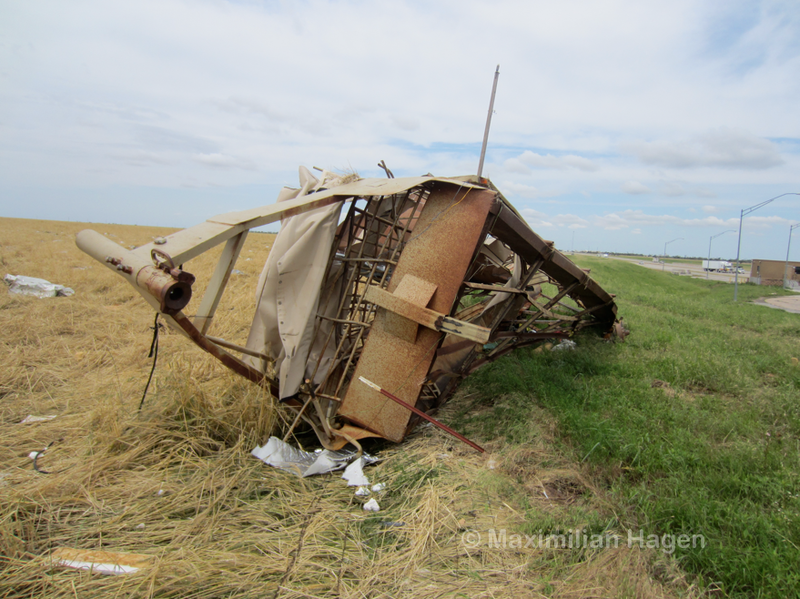 A Weather Channel vehicle driving on Highway 81 was impacted by a violent wind feature, causing it to tumble through an adjacent field (initial reports stated the car travelled 200ft while later broadcasts reported 200 yards). All of the vehicle’s passengers were injured to some degree but most were able to walk away from the wreckage. 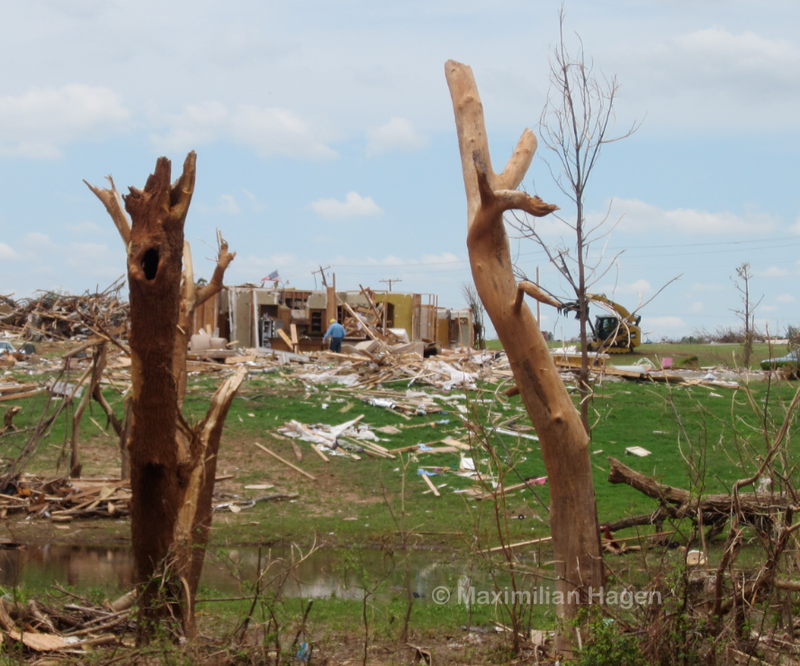 Around this time, the tornado was completing an unexpected turn to the northeast. 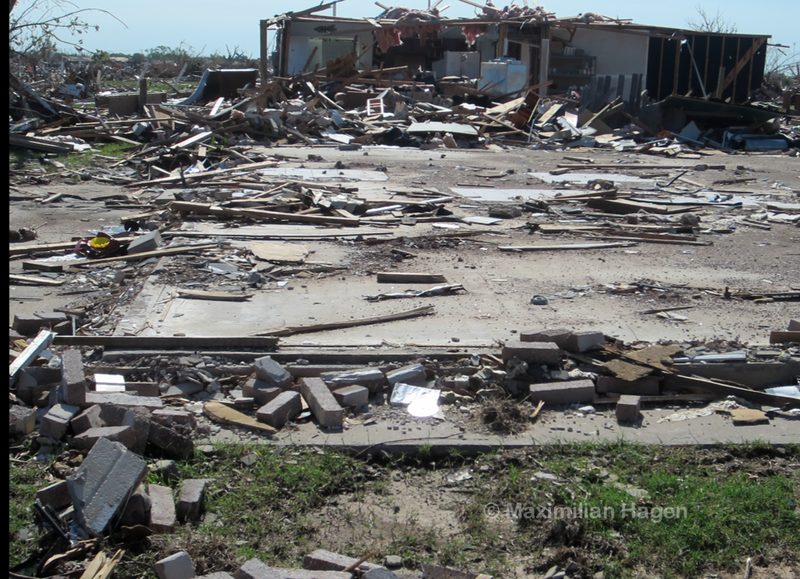 Highly knowledgable storm chasers were caught off guard by the storm’s size and unpredictability. A motorist due east of the Weather Channel crew was killed by the tornado at the intersection of Alfadale Road and Reno Street. Along SW 10th Street, a white car carrying three professional storm chasers was swept off the road west of Radio Road. 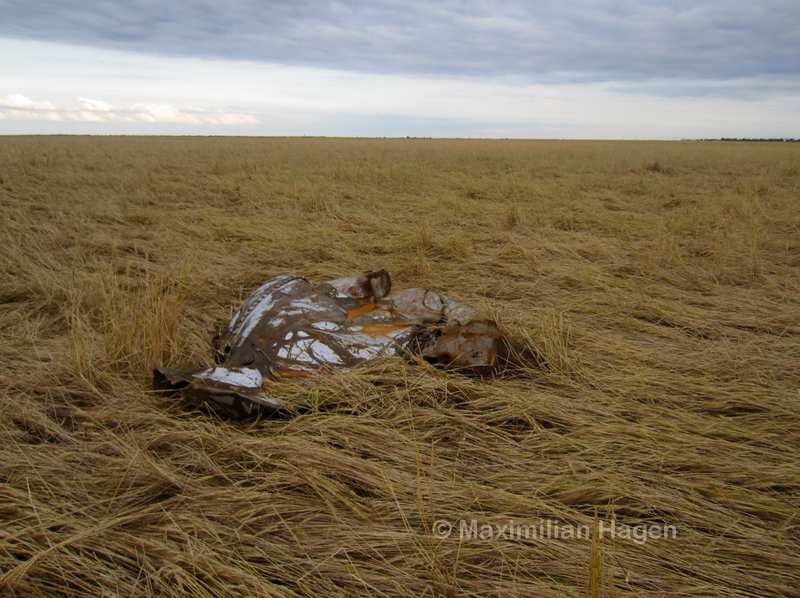 Unlike the Weather Channel vehicle, the car driven by Tim Samaras was hurled 650 yards through the air at a high rate of speed (AMS, 2013). 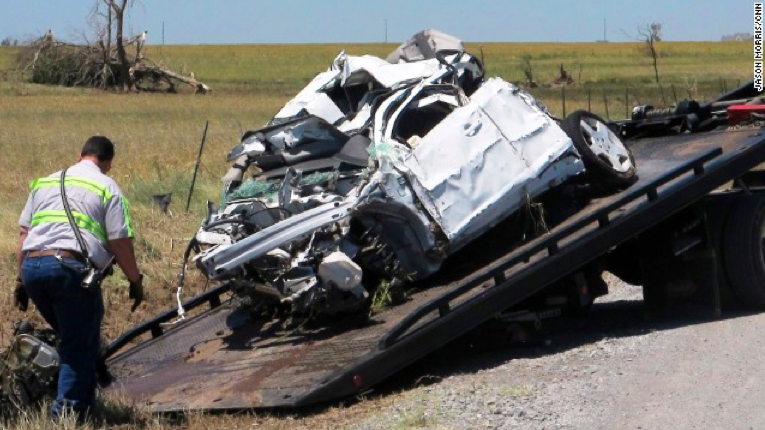 The three chasers, likely with cameras in hand, were all killed in the “unsurvivable” wreck. Several minutes later, the tornado swept across the I-40, killing a young mother and her infant son in a car hurled from the freeway. Forty minutes after first forming, the tornado weakened and dissipated. 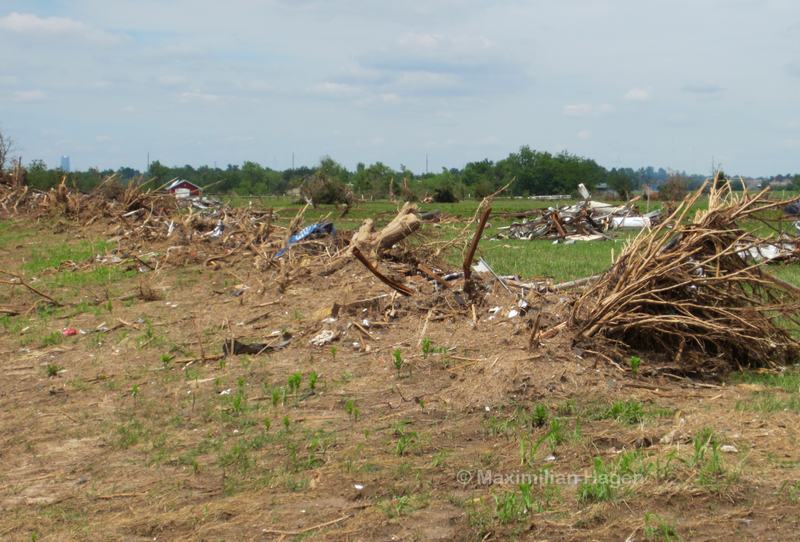 I surveyed the damage from the El Reno tornado and interviewed local residents on June 4th and 5th. 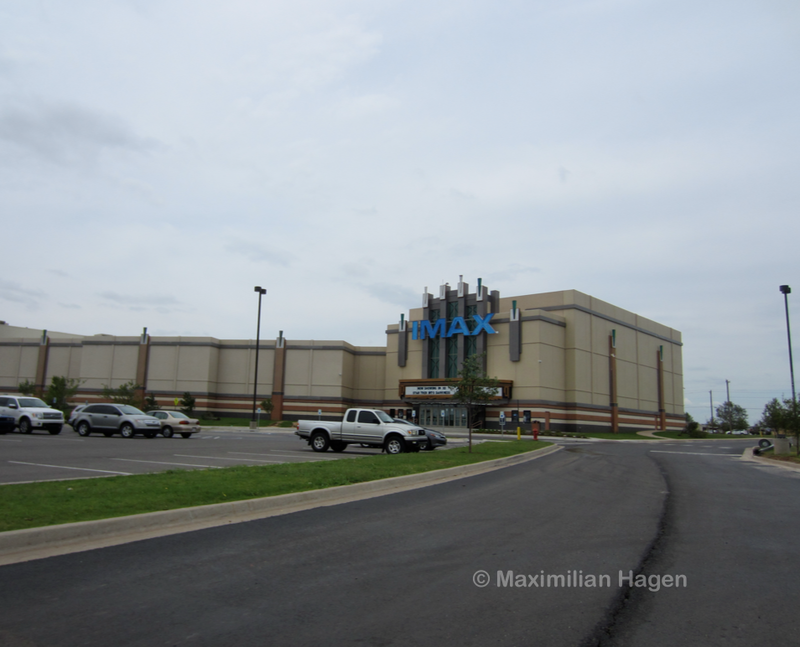 Photographs from my survey are shown below, and my final analysis can be found at bottom. 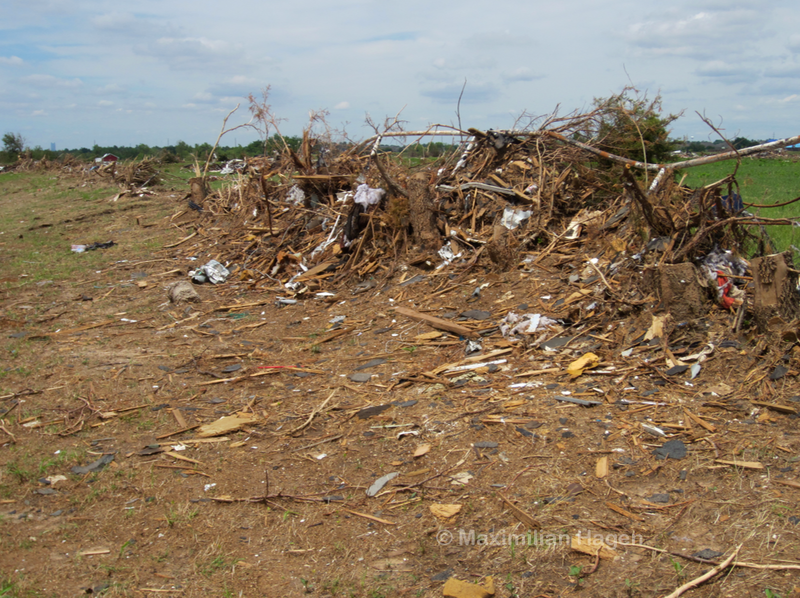 *In August of 2013, the El Reno tornado was officially downgraded to an EF3 by the National Weather Service (Querry/NWS, 2013). 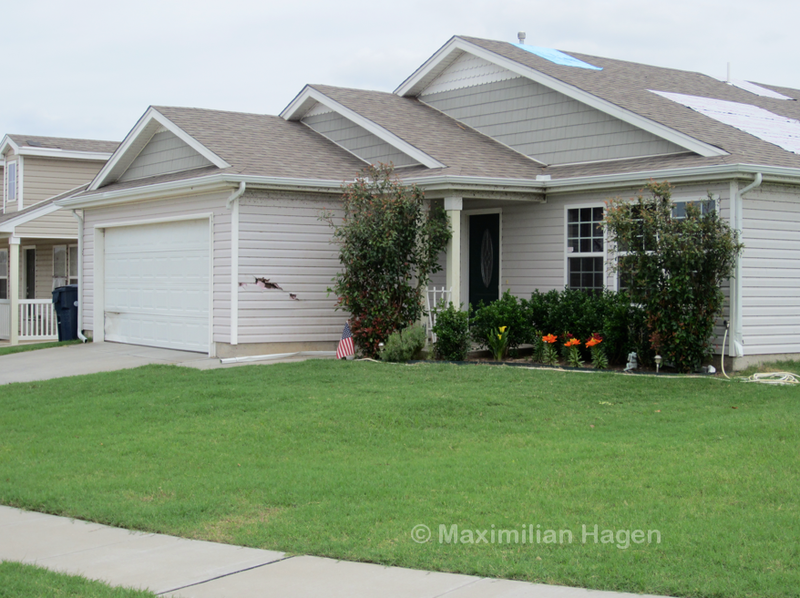 A home just south of SW 15th Street along Highway 81 experienced EF1 damage despite being near the geographic center of the storm. 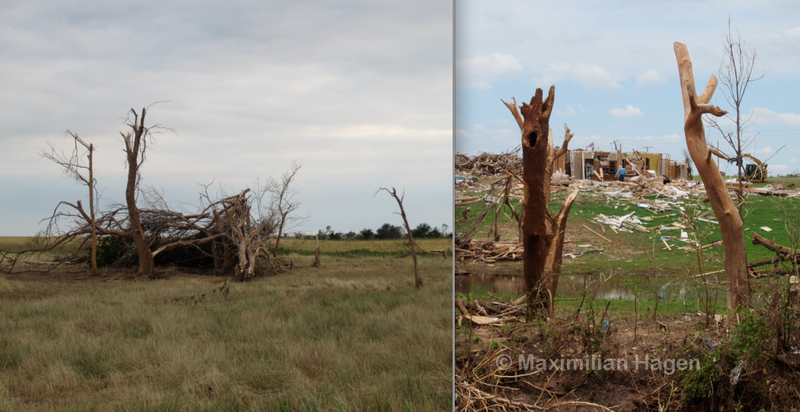 The tornado’s multi-vortex nature meant that most of the damage swath encountered winds in the EF1 and EF2 range. 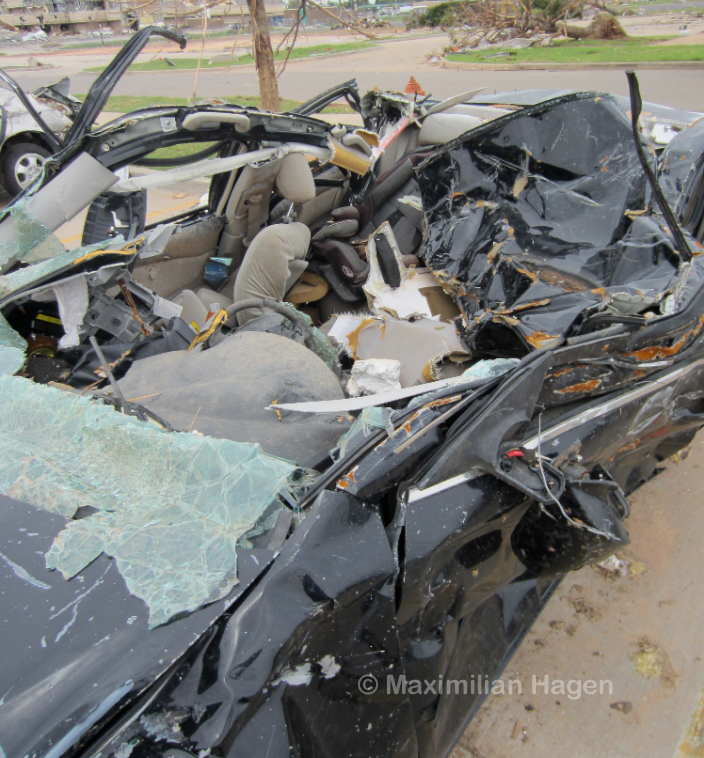 The tornado’s first two fatalities occurred in two vehicles a mile west of Highway 81 along SW 15th Street (KFOR, 2013). 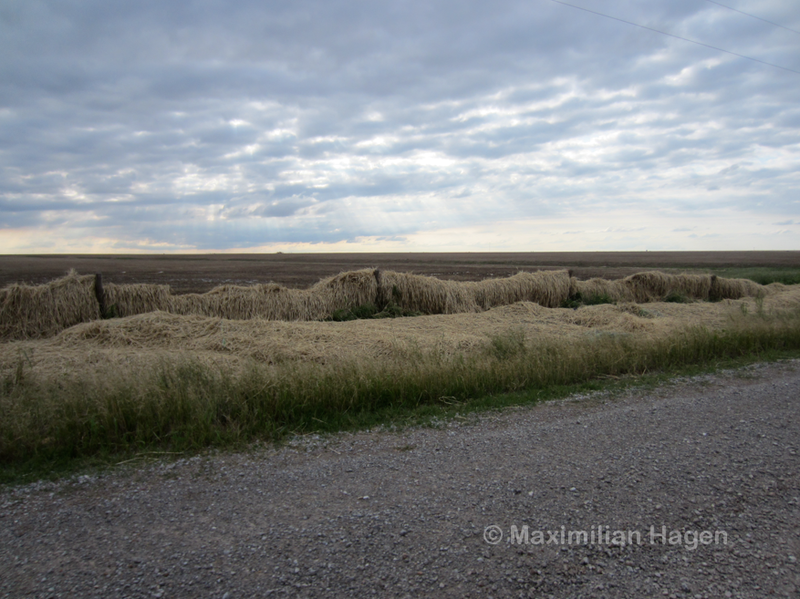 Wheat crop was blown to the ground in swaths approximately 50ft wide a half mile east of Highway 81 on SW 15th Street. 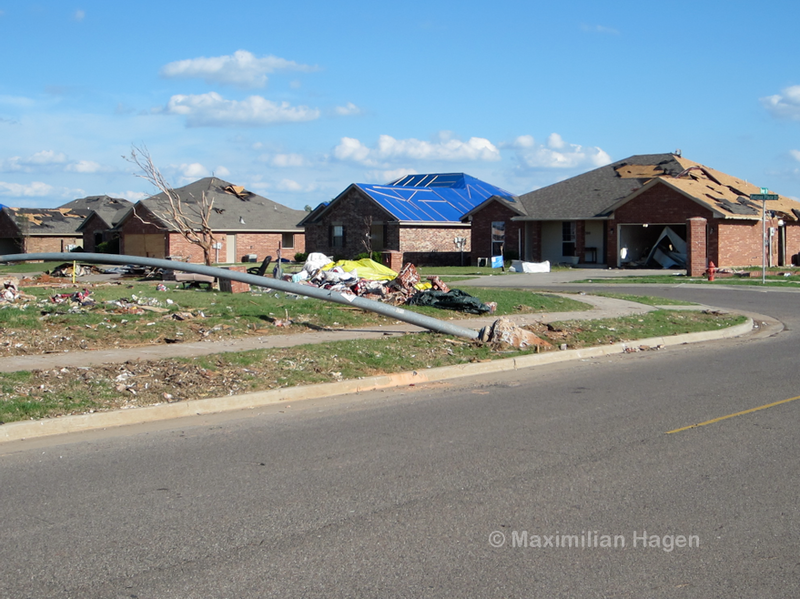 Fence posts adjacent to homes that experienced EF1 and EF2 damage were generally only lightly damaged. In other areas they were bent to the ground or removed entirely. 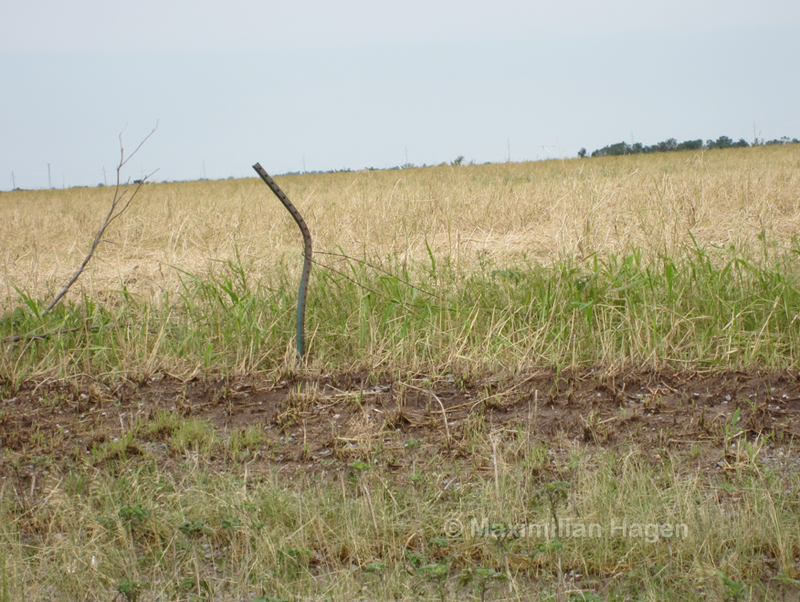 In some instances, metal stakes were twisted due to bursts of winds from various directions. 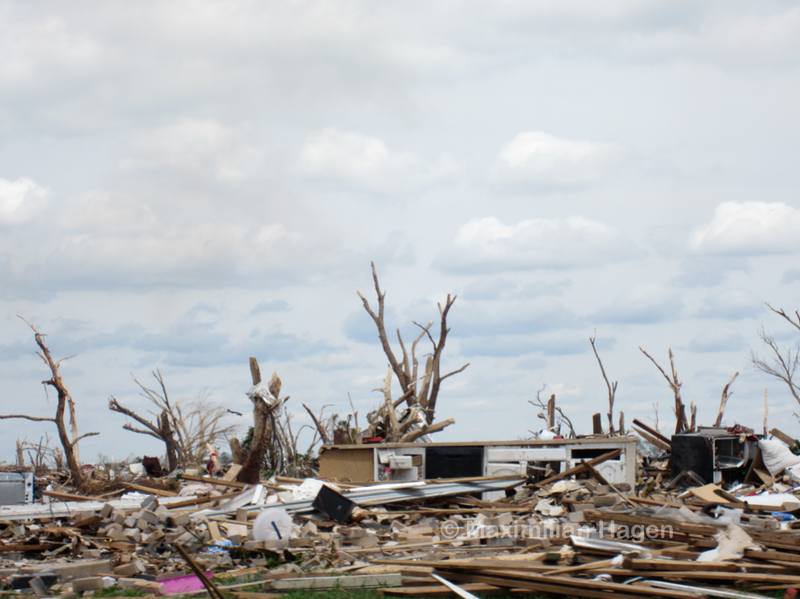 A home on Alfadale Road experienced EF2 damage. A motorist in a vehicle at this intersection became the storm’s third fatality. 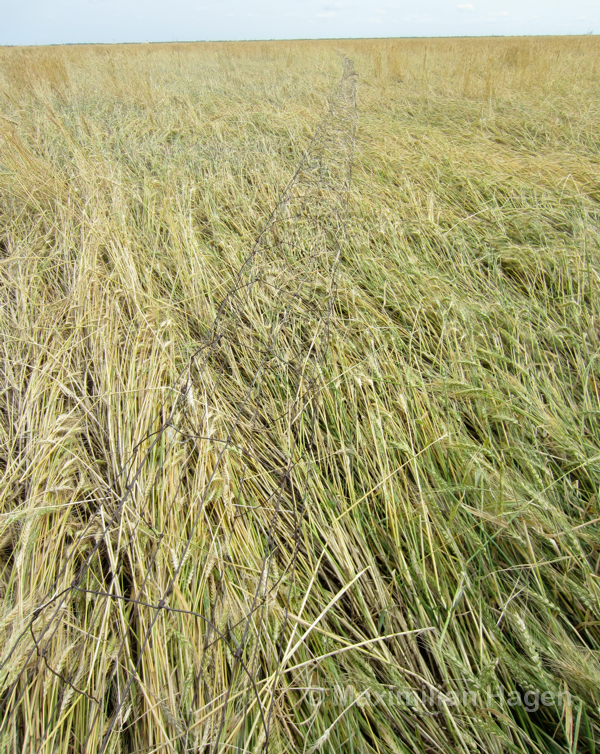 A blizzard of dry plant materials was caught by standing fences along Radio Road. 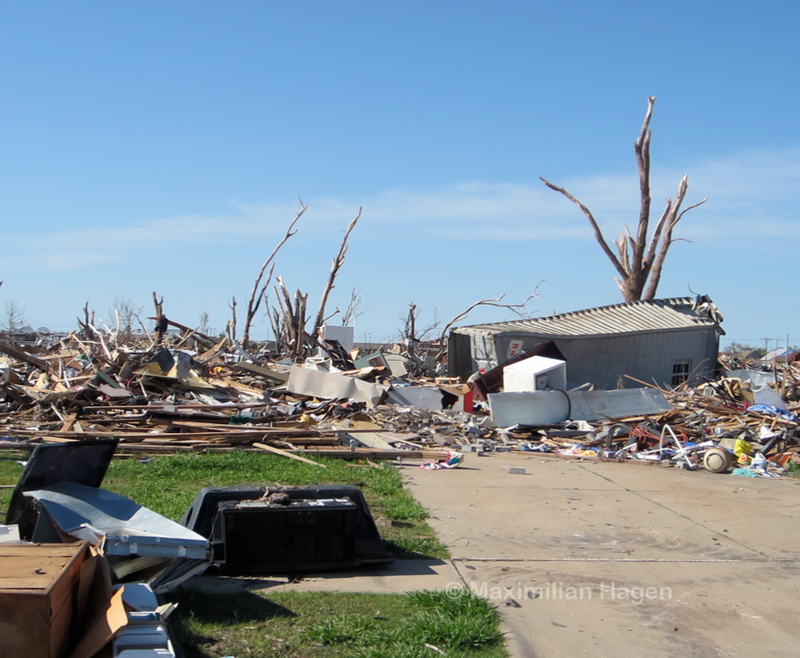 View northeast at the intersection of Radio Road and 10th Street, where the most intense winds were recorded by mobile doppler radar. While analysis is ongoing, velocities between 290 and 336mph were recorded as a single, exceptionally powerful sub-vortex slingshotted around the south side of the tornado at 177mph. The peak winds occurred on the eastern edge of the vortex where all of the rotational velocities combined. 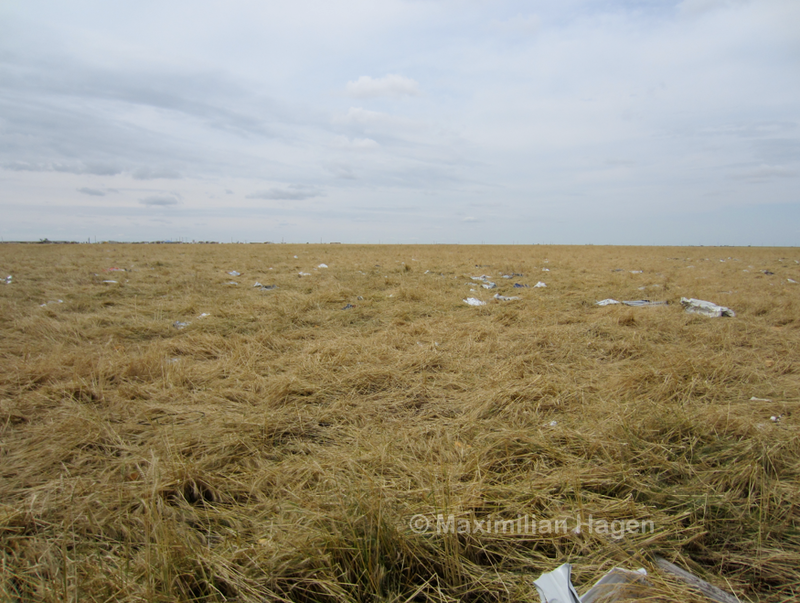 While of record intensity, the peak winds were found 110 yards above the surface and would have impacted a standing structure for only half a second (AMS, 2013). 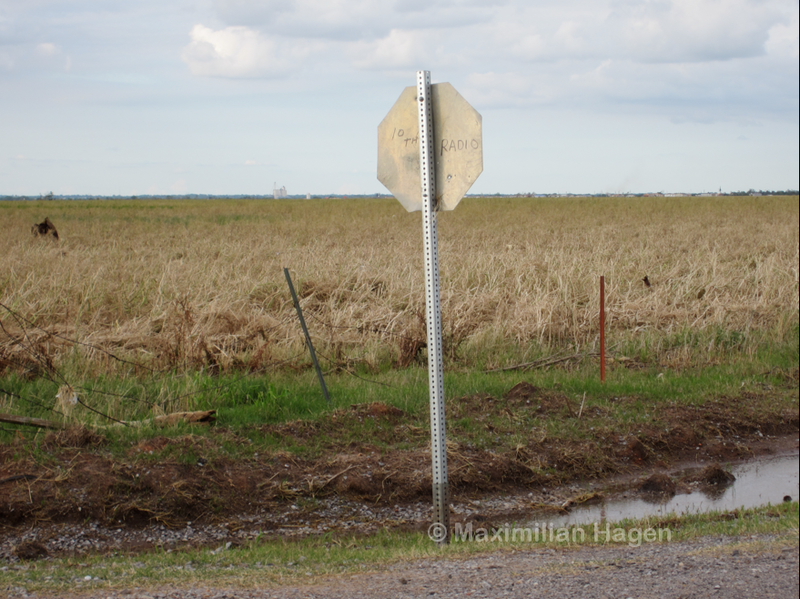 10th and Radio Road was marked by a sign placed after the tornado to direct local traffic. The only tree near the intersection of 10th and Radio Road was stripped of leaves and damaged in a fashion consistent with past EF4 tornadoes. 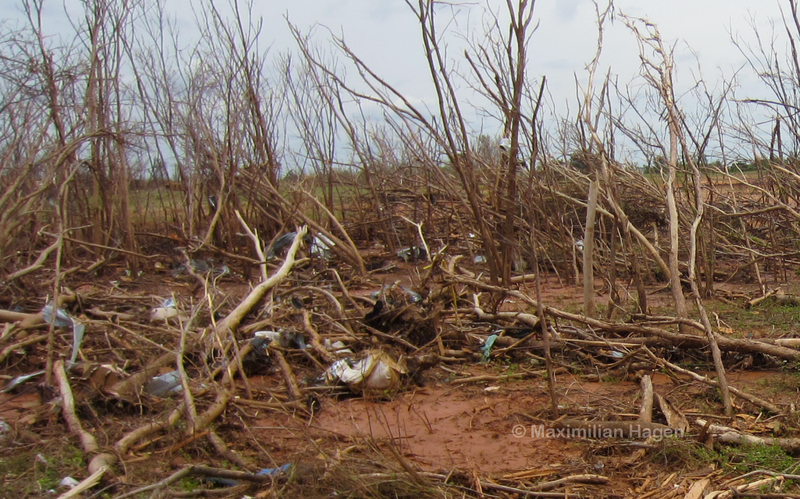 Vegetation was blown to the ground and strewn with small pieces of debris, including fragments from destroyed vehicles. 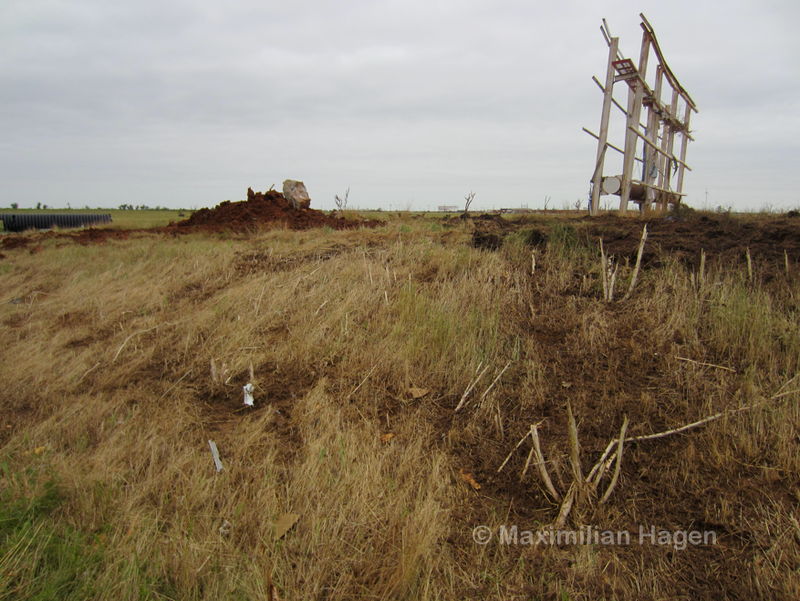 Metal fence posts were bent to the east-northeast or absent entirely from the ground. 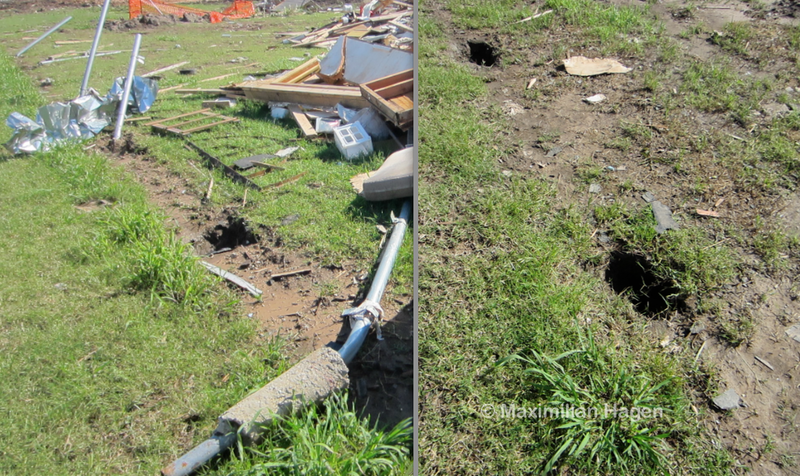 The gravel along 10th Street was blown almost completely away in areas affected by sub vortices. 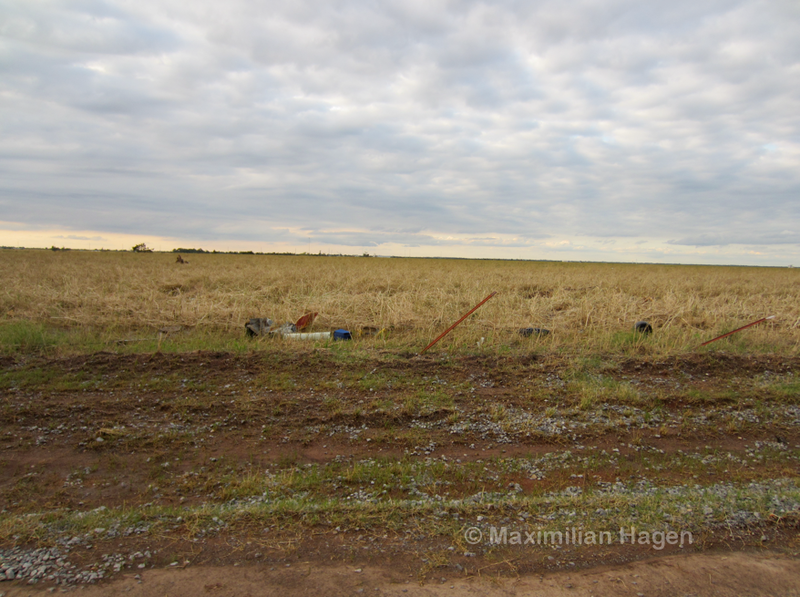 This is where a vehicle driven by Tim Samaras was recovered. 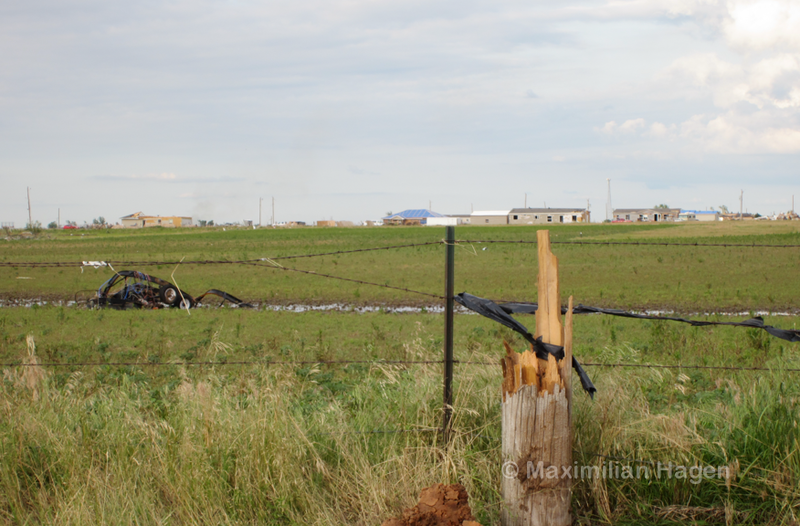 A fence was ripped from its posts and left in a tangled mass a half mile northeast of 10th and Radio Road. Area near 10th Street where the chase vehicle was swept off the road. 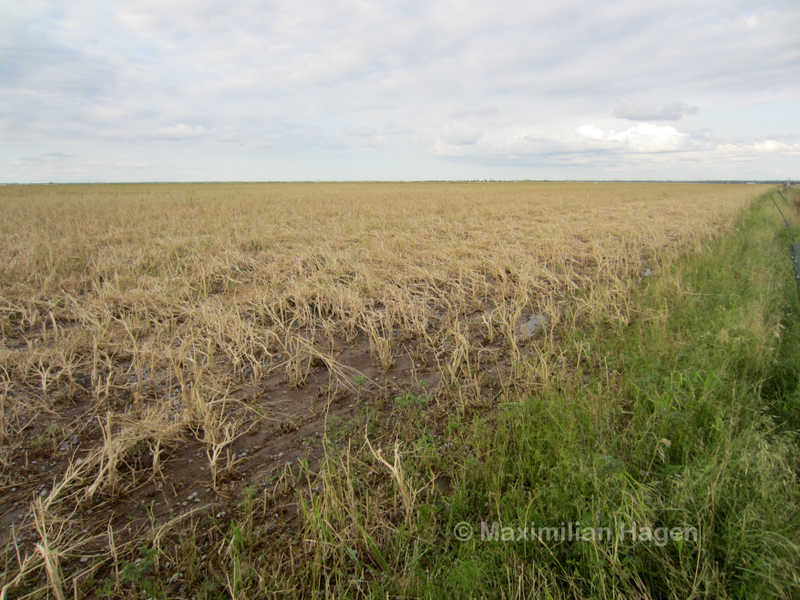 Flattened wheat crop just south of 10th Street. 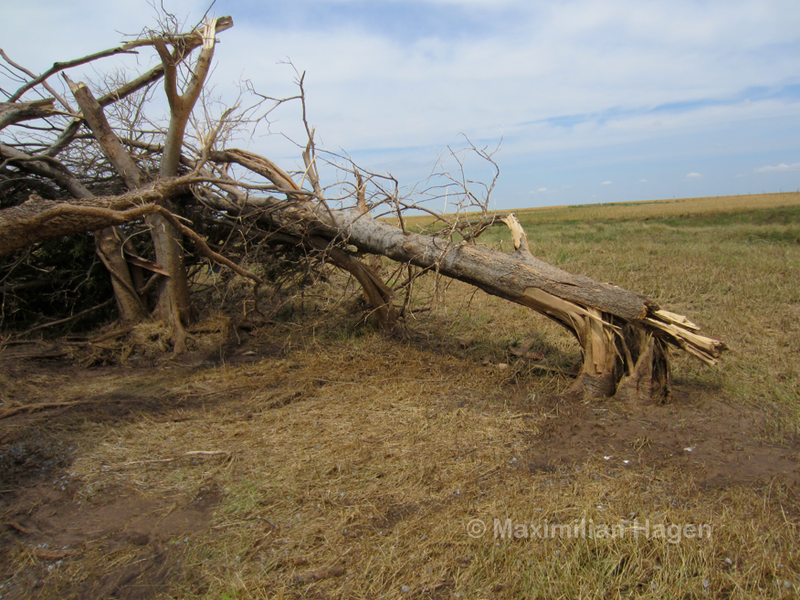 Tree damage near where the chase vehicle was overtaken by the storm. Trees 100ft to the north on the other side of 10th Street were damaged but not defoliated. 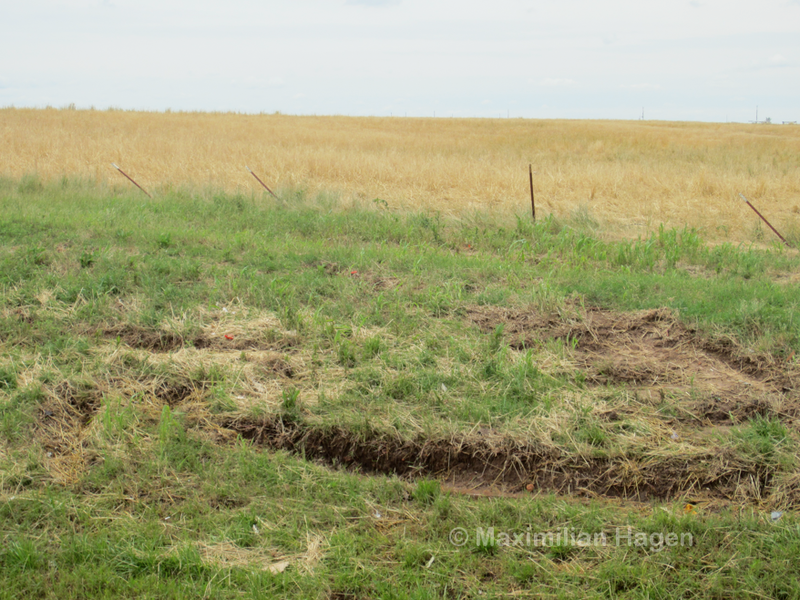 Flooding carved deep ditches into areas that were previously flat fields. 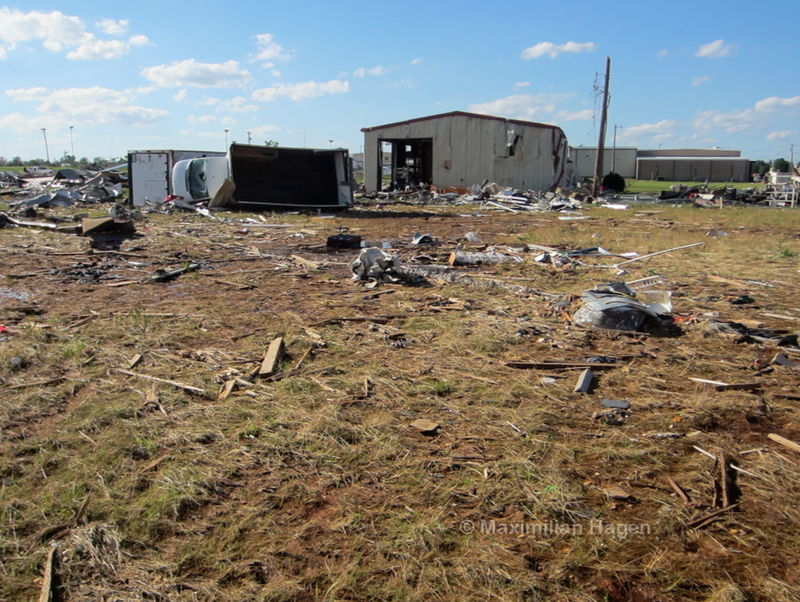 A quarter mile south of the I-40, an RV company was severely damaged in the tornado. A vehicle from the facility was thrown several hundred yards. 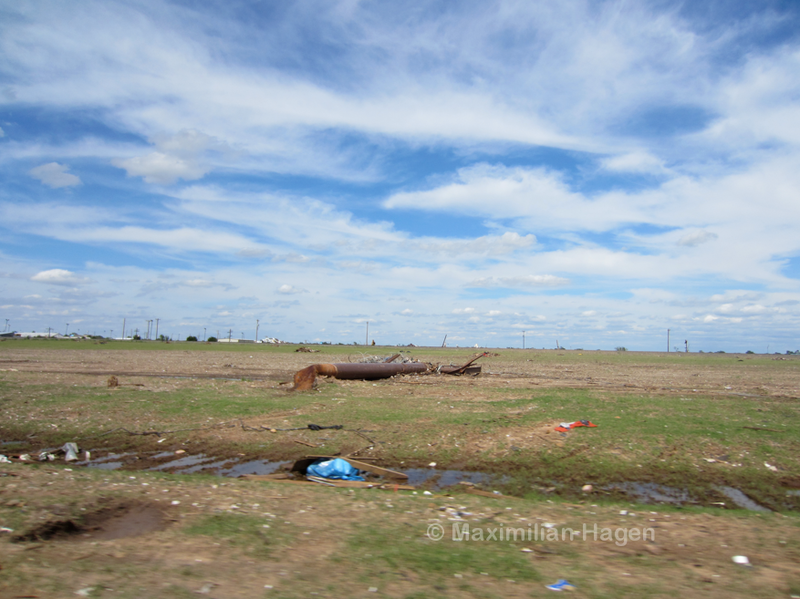 Most of the powerlines along N2880 Road were snapped just above ground level. 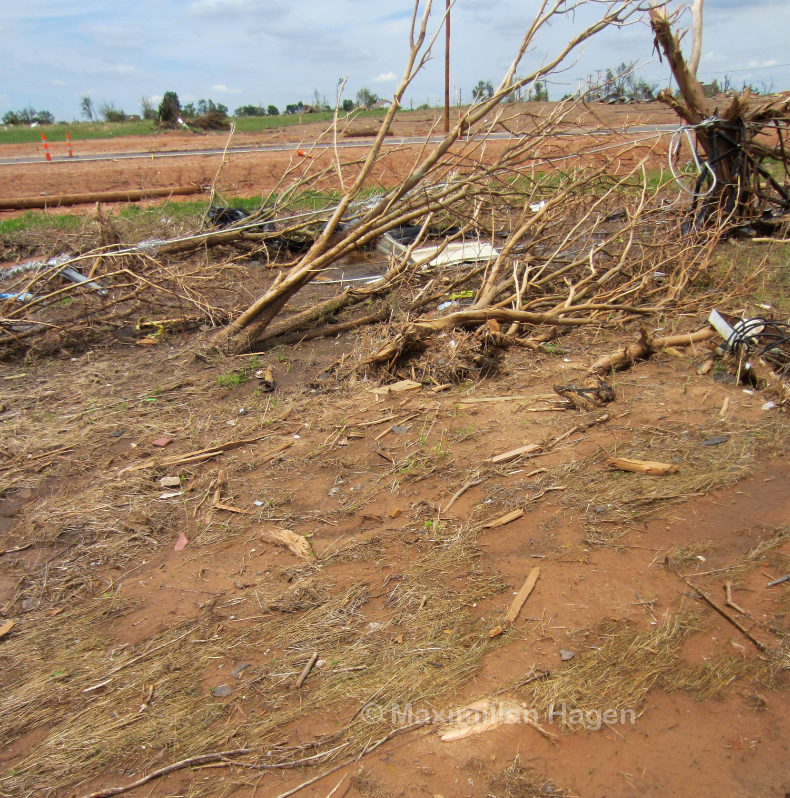 Some of the most severe vegetation damage appeared to be along the I-40, north of where the peak doppler velocities purportedly occurred. A livestock trailer was blown over 300 yards to the south from a complex across the freeway and left tangled in the remains of a fence. 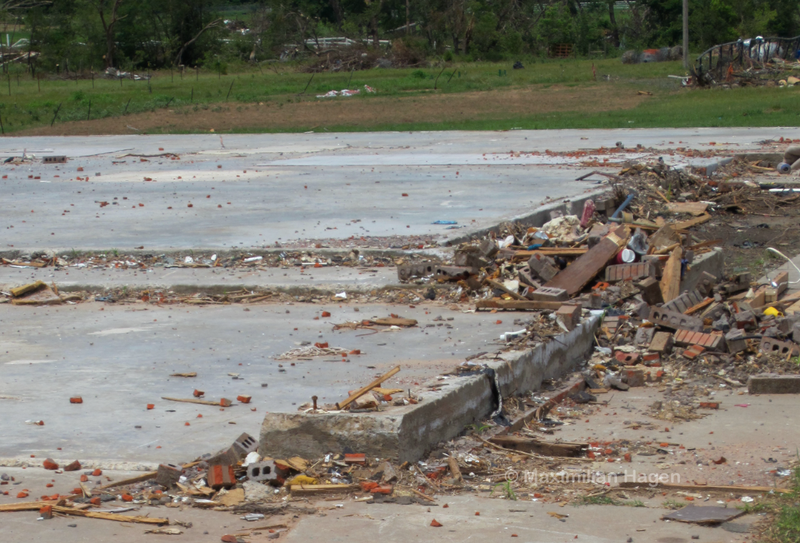 View of the destroyed OKC West Livestock Market where the trailer originated. 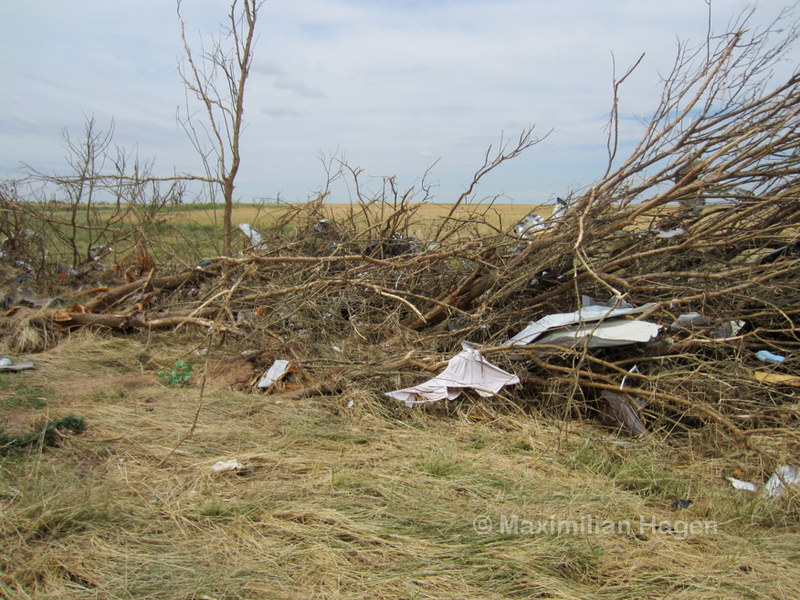 Debris in a wind-damaged field just south of the I-40. 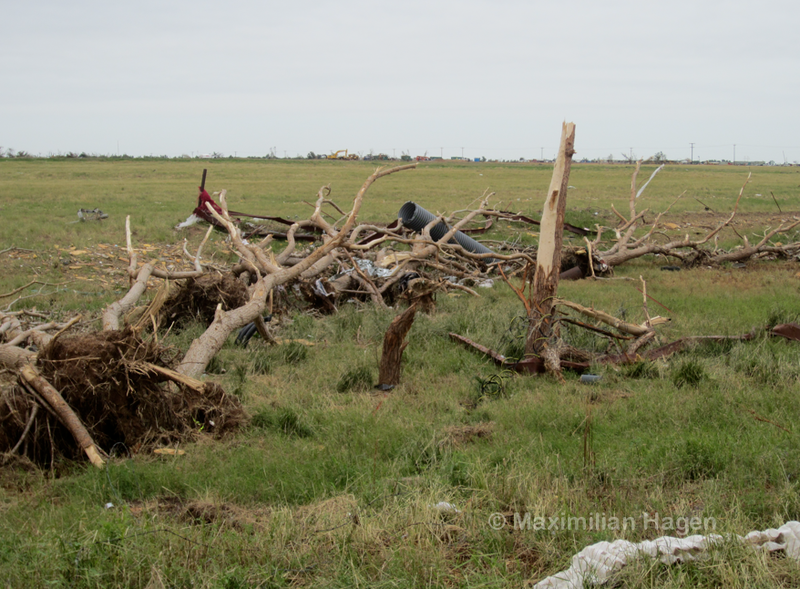 Tree damage just south of the I-40 near the OKC West Livestock complex. The tornado’s massive size and slow movement would have exposed many areas to tornadic winds for greater than five minutes, though peak velocities occurred only in suction spots. 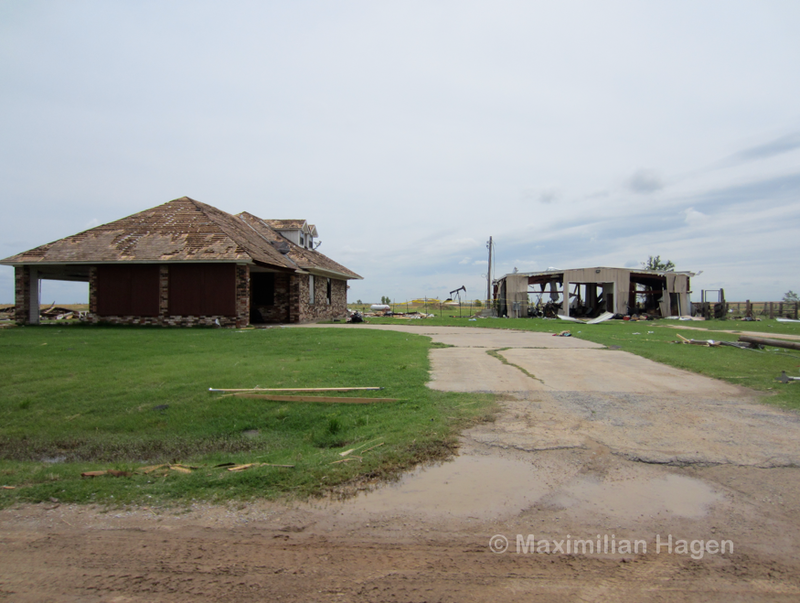 Extremely heavy rainfall on the day of the tornado led to widespread flooding in the affected areas. 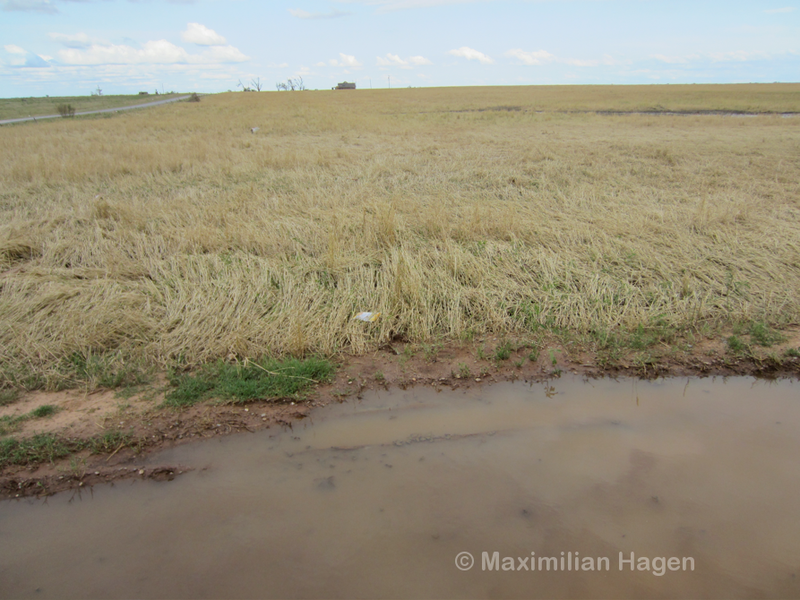 Visible here is the OKC West Livestock Market and a pool of water that trapped large pieces of debris, including sections of broken powerlines. 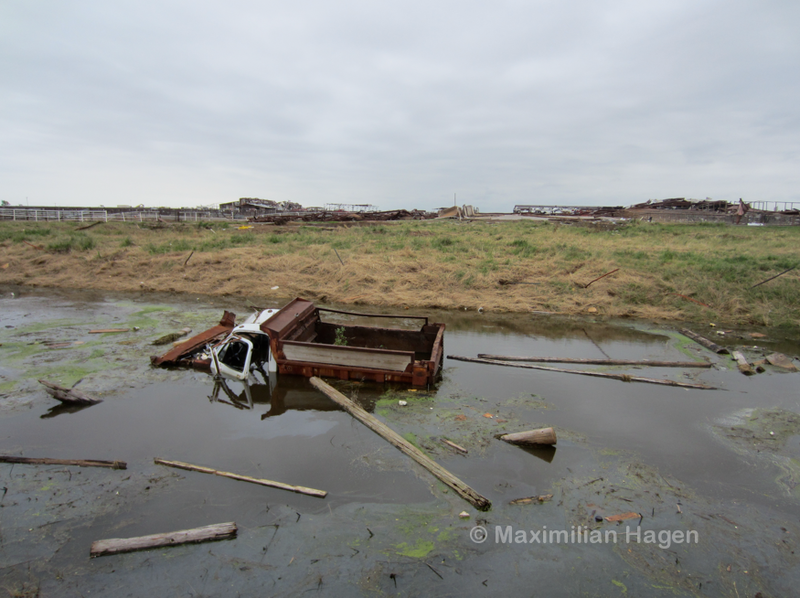 Closer view of the destroyed livestock complex. 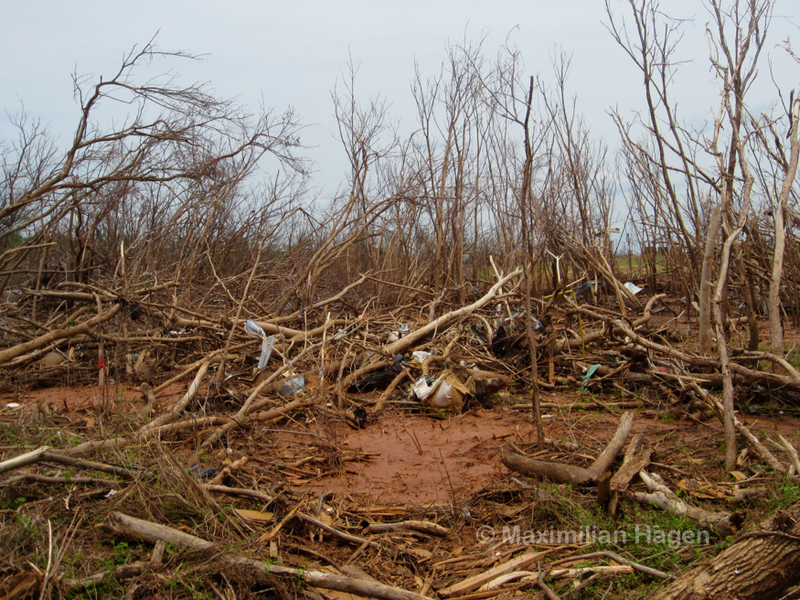 Dozens of large animals were killed throughout the tornado’s path, leaving the smell of rotting flesh several days later. Heavy tree damage just north of OKC West. 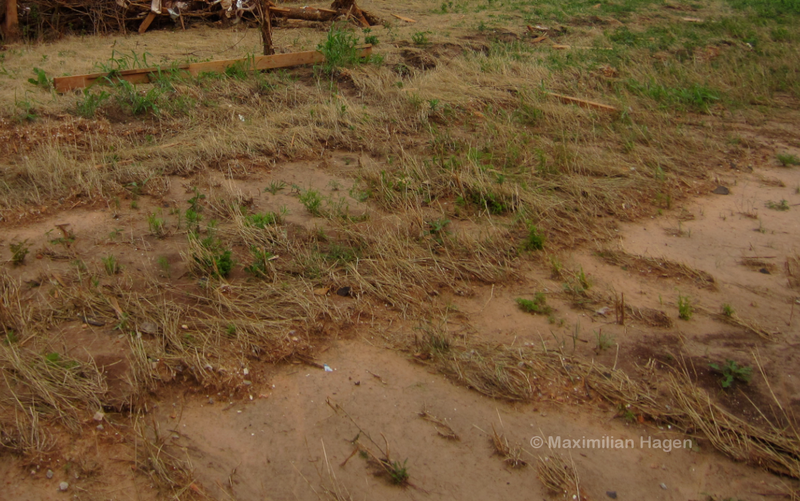 Deep impact mark on a hillside adjacent to the I-40. Several vehicles were swept from the freeway in this area, resulting in two fatalities. Due to my belief that the Enhanced Fujita Scale grossly underestimates winds in violent tornadoes, the wind ranges I utilize are based on my research, discussions with wind engineers and comparisons between known surface readings and adjacent damage indicators in past tornadoes. My wind estimates are significantly higher than those employed by the National Weather Service. 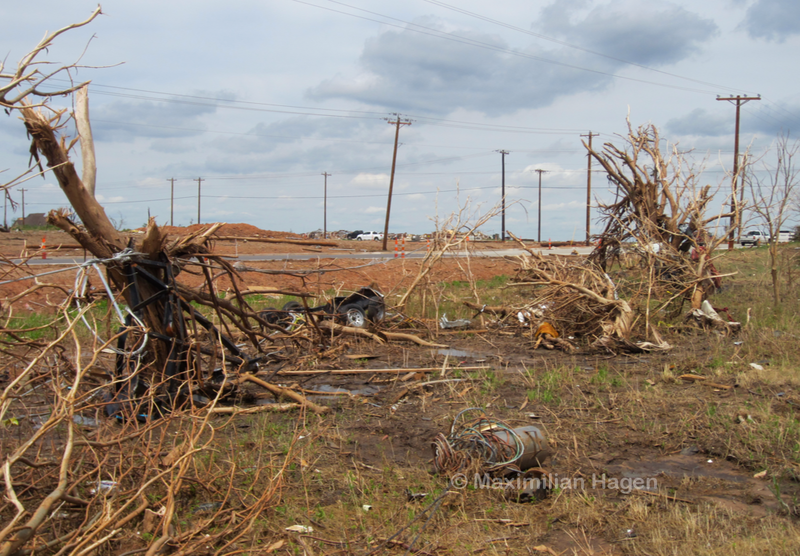 □ The most intense damage occurred to vegetation in a swath of varying width from an area commencing just west of the intersection of 10th Street and Radio Road and ending at the I-40. 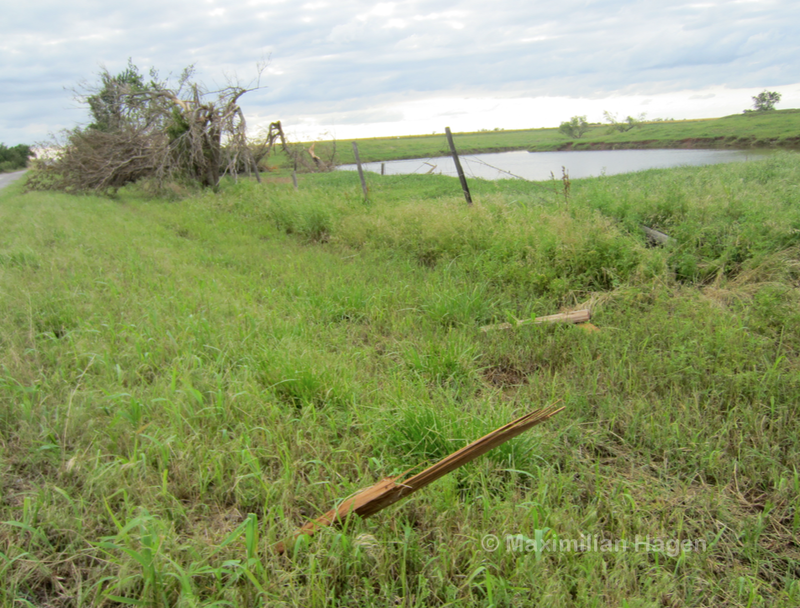 Steel fence posts were bent to the ground by winds alone and not debris impacts. 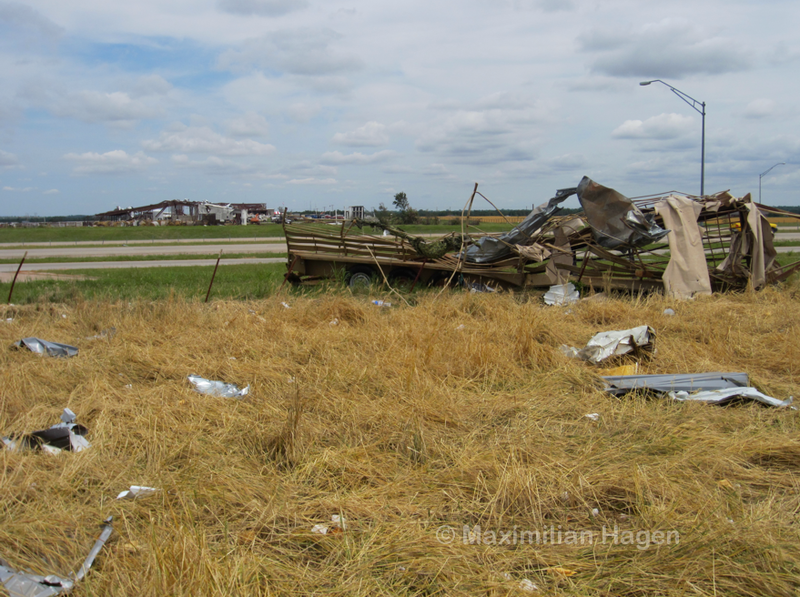 Powerlines were sheared just above ground level, vehicles were thrown over 200 yards and surface crops were severely damaged and bent to the east-northeast. 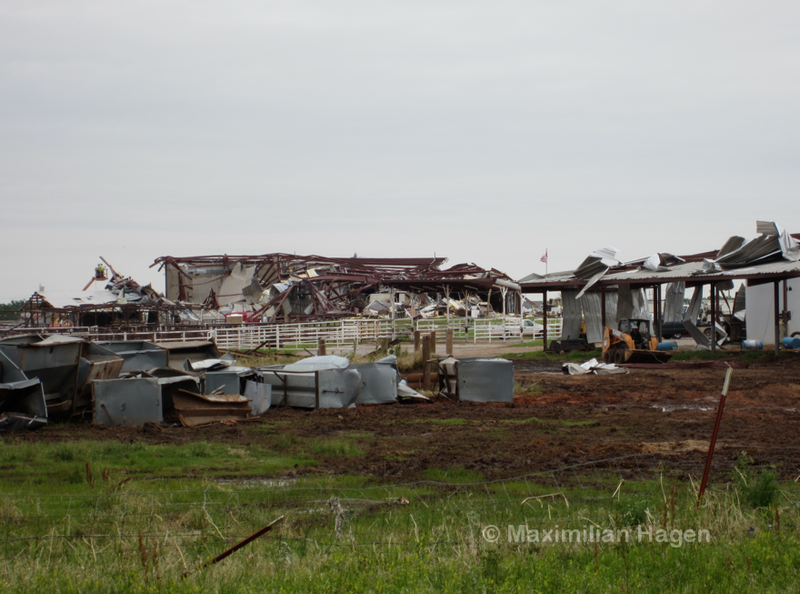 The most intense structural damage likely occurred to the OKC West Livestock Market just north of the I-40 and several homes west of Highway 81. 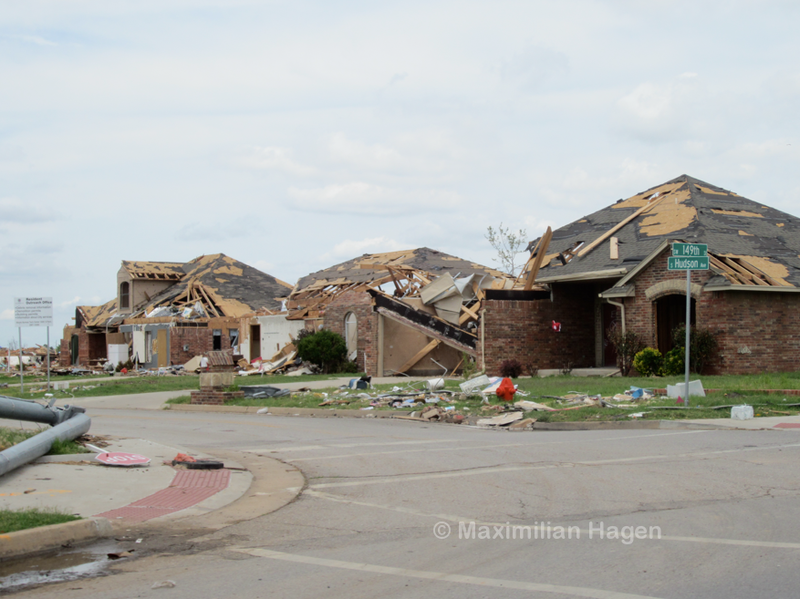 The most intense structural damage was consistent with winds in the EF3 range. 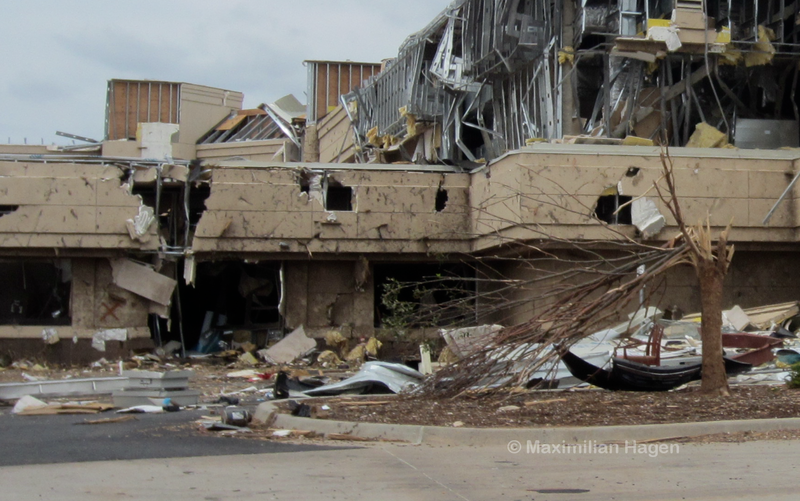 The scarcity of trees and buildings left few reliable damage indicators, but no EF5-level vegetation damage was noted. □ While the tornado has been deemed the “second strongest” in recorded history due to extreme doppler velocities, this claim is completely unfounded. 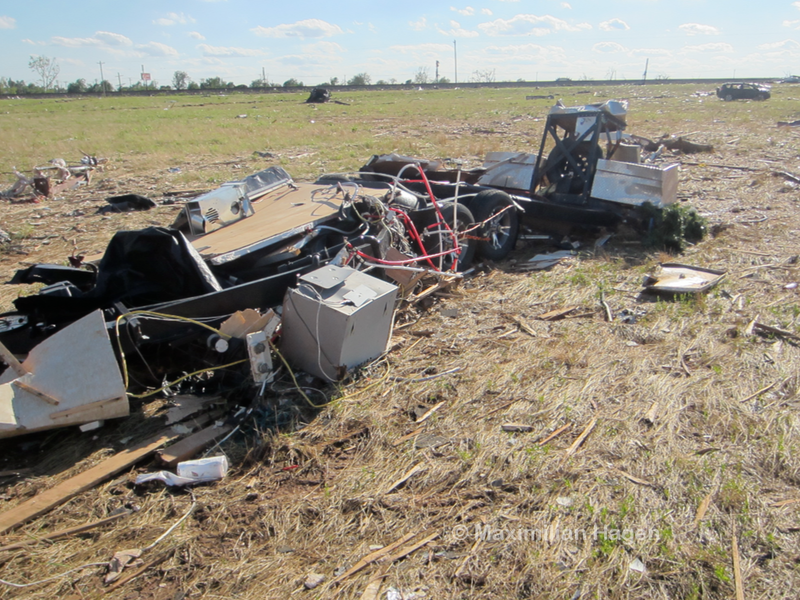 Few violent tornadoes are ever tracked by mobile doppler radar, so the available readings are not an objective method of classification. □ While the tornado is being called the “widest” in history, this claim is also unfounded. 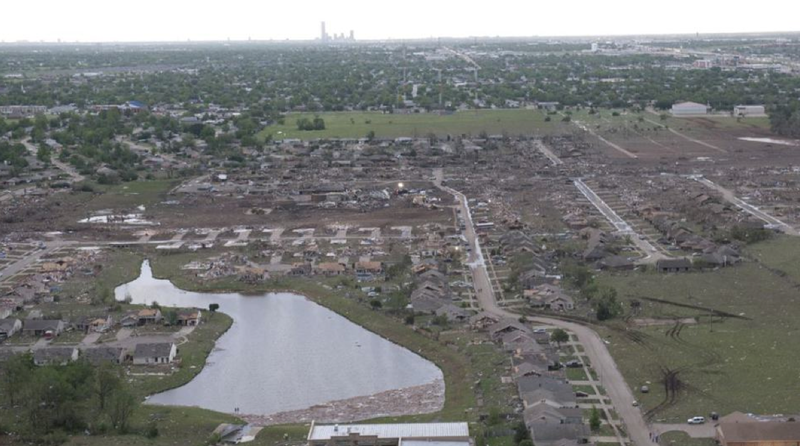 The 1999 Mulhall tornado likely left a significantly wider damage path. 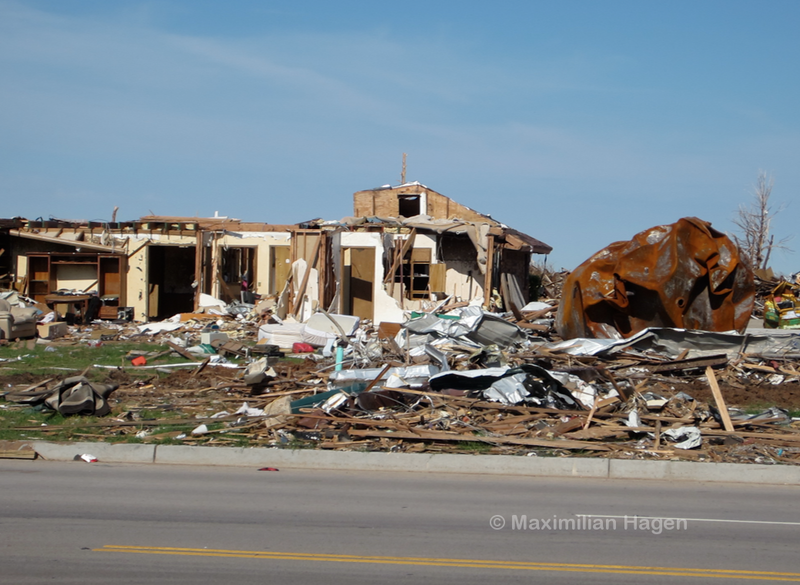 In terms of violent tornado damage, the damage swath from the 2013 El Reno tornado was narrower than many documented tornadoes, including the 2011 Joplin tornado. 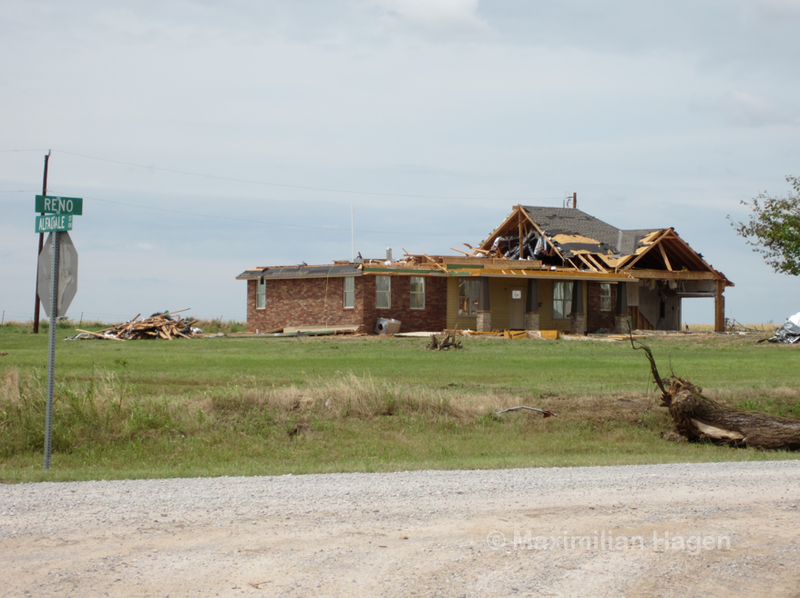 The width of EF0+ damage along Highway 81 was 2.55 miles in width, as measured by the distance between the northernmost and southernmost instances of missing shingles and downed tree branches. The southern margin was 300 yards south of SW 29th Street and northern margin was just north of 10th Street. 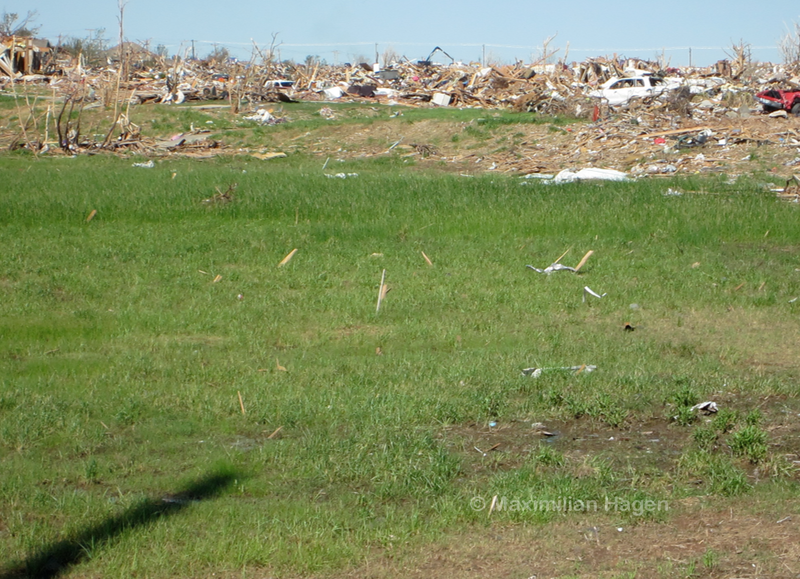 Straight line wind damage was found in areas unaffected by the tornado, so the exact damage contours were impossible to ascertain. 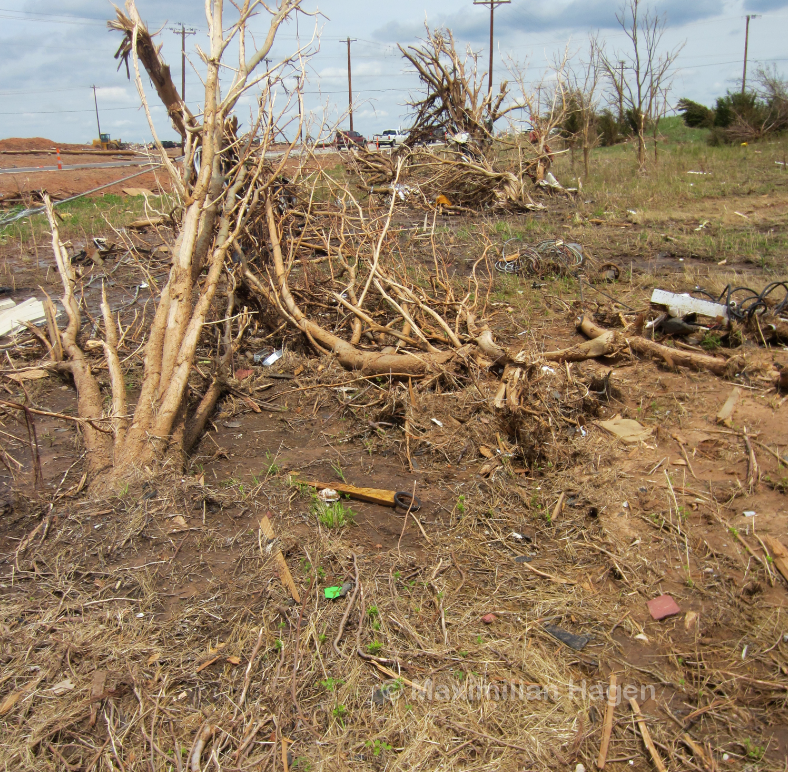 The vegetation damage from the El Reno tornado was noticeably less intense than the damage caused by the 2013 Moore tornado. 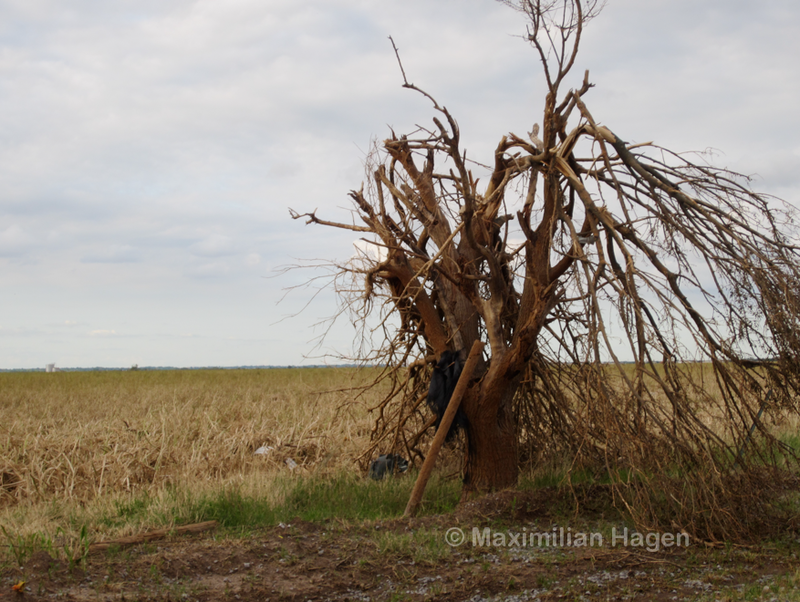 Few trees were debarked in El Reno, whereas all of the trees in the core damage path of the Moore tornado near County Edge Drive were completely stripped of bark and branches.